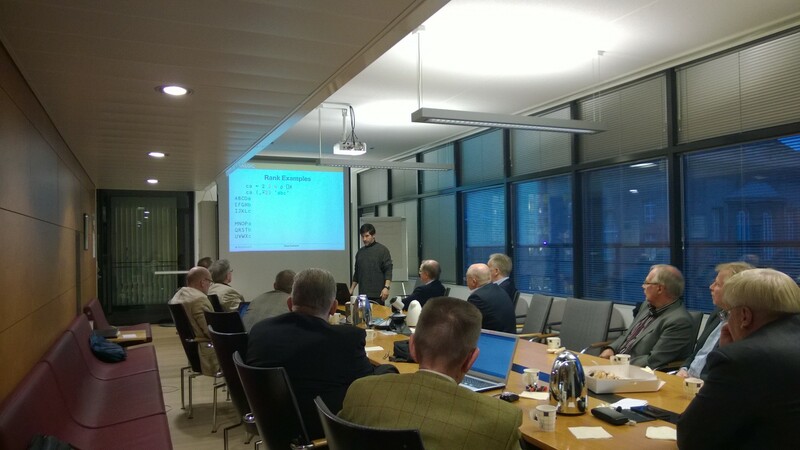 On the last Thursday of November, I had the privilege to meet with with some members of the Finnish APL community in at the Vatt Institute for Economic Research in downtown Helsinki. The morning was spent engaged in lively conversation about user interfaces and Dyalog APL. In particular we talked about MiServer – Dyalog’s framework for cross-platform user interface development – and the RIDE (Remote Interactive Development Environment). MiServer can run on any platform where Dyalog APL runs. As such, I was able to demonstrate several examples of web sites running under MiServer on a Raspberry Pi. With RIDE, one can access a Dyalog APL development environment via a TCP/IP connection – the development environment can be on the same machine as RIDE or on another machine, as long as it is listening for a RIDE connection. While Dyalog APL for Windows has always had windowed interactive development and debugging capabilities, RIDE brings a comparable level of capability to environments which were previously limited to only TTY-based terminal interaction. About a dozen more FinnAPL members joined us for the afternoon session where I spoke about some of the recent features of Dyalog. We discussed Function Trains, the Rank operator, the Key operator and user commands. We looked at both recently introduced and some of the long-established user commands. I demonstrated how to create a new user command (command AIKA=TIME in Finnish!) and how to debug it before letting the group conclude their meeting. The day ended with nearly all of us going out for dinner and a few drinks in Helsinki, which looked wonderful with all its Christmas decorations. It’s always a pleasure to be able to sit down, share time and exchange ideas with fellow APLers.